Need somewhere for all your raw files? The 8TB Buffalo LinkStation Pro Quad, perfect for keeping all your important files safe, could be yours. 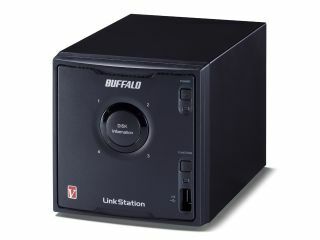 Buffalo's LinkStation Pro Quad is the ideal solution to keep important files safe. It features ultra fast data transfer speeds, with the drive able to be configured in RAID 0 for performance or RAID 5 for redundant storage. Basically, that means if your hard drive fails, your data is safe. With a huge 8TB, the Buffalo LinkStation Pro Quad is perfect for storing large numbers of files, which can be streamed from anywhere in the world via a web browser or via iPad, iPhone, iPod touch or an Android Smartphone. Photographers will also enjoy the "Direct Copy" function, which allows one touch transfer of media files from any digital camera or camcorder. USB Device server - connect and share a Multifunction USB 2.0 printer on your network. More information can be found on the Buffalo website, while users can also join the Buffalo Facebook page to get the latest updates. This competition is now closed. The winner is Mrs A Sproates.